Wish to Book Your Next Hop on Mokulele Airlines? Book your next Island Surf Adventure. Affordable Adventure Awaits! Visit mokuleleairlines.com to learn more! Great Things Happen when we strengthen our communities one neighborhood at a time. So does success in competition. Mokulele's Surf Team Keiki are the best at what they do and Mokulele Airlines helps them to get to where they need to be! The ohana that makes up Mokulele knows that great kids become great adults. As a family airline, Mokulele is passionate about helping the communities in which they serve. It’s our kuleana to give back. That’s why they created the Mokulele Surf Team. 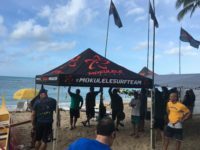 Mokulele sponsors each members air between the islands so they never miss the epic swells and also get the chance to collaborate with their peers state-wide. 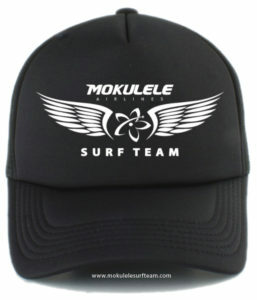 The Mokulele Surf Team are ambassadors of the brand and at Mokulele ohana is our core value. It's a blessing to be able to give back. Mokulele Airlines sponsors keiki starting at the age of 8. Each kid has shown a kindness for others, a drive for success, and an incredible ability to be the best at what they do - SURF! Mokulele airlines isn’t your typical air carrier. For the most part they fly out of smaller airports that offer free parking and avoid the hassle of TSA screenings (with the exception of Honolulu International). They fly planes that turn every flight into a sightseeing adventure and they sponsor their own surf team. For the people that know Mokulele, that’s exactly what’s expected from Hawaii’s favorite island hopper. Jeromy Hansen, son of founder and owner Ron Hansen, has long been an avid surfer. As a way to give back to the community and help local kids compete around the state, Jeromy founded the Mokulele Surf Team in 2012. Mokulele gets the kids and their boards to competitions around the state for greatly reduced fees. According to Jeromy, Mokulele’s mission is helping people across Hawaii connect. 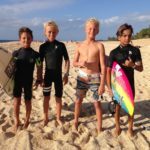 For his young surfers that means meeting up with other team riders on neighbor islands, bringing families together, and expanding the Aloha State’s surfing ohana. Without Mokulele’s generous sponsorship many of the competitors would be unable to afford the travel costs necessary to get from competition to competition throughout the islands, and on special occasions, beyond. That would be a real loss as a fair share of Mokulele’s surf team members are not only tops in the State, but ranked nationally as well. In fact, Mokulele’s own Summer Macedo won gold in October 2015 following a historic week of competition at the ISA world junior surfing championship in Oceanside, California. The hotly contested event featured 322 of the world’s best junior surfers from 36 countries. Thanks to the outstanding performances of Summer and her teammates, the USA was crowned World Team Champion for the first time in the history of the event. For everybody on the Mokulele surf team, that’s exactly what was expected from Summer. That's just the beginning. Follow us on this adventure. Help support raise the next generation of surfers in Hawaii.